Parking Lots – Clean Sweep, Inc.
Clean Sweep, Inc. is proud to be Louisiana’s best parking lot sweeping services provider. Our professional management and service teams have the answers you need. There are many reasons why sweeping – with Clean Sweep, Inc. – provides lasting value to your property. Not only will we keep the outside of your property looking great. In addition, you will find your pavement striping and sealcoating to last longer, as will the inside floor surfaces that lead from your parking area. Let us keep your property performing and lasting longer than ever before with professional parking lot sweeping services. Managers monitor all of the services we provide to assure peak performance. Our experienced management team maintains a thorough follow-up procedure designed to maximize employee training and make sure you receive consistent, industry-leading results with every sweep. Our training includes the important concept that we are ‘the eyes and ears’ of our property managers. When emerging needs or unusual situations are spotted, such as lights out, illegal dumping, graffiti, etc., we contact the customer. At the customer’s preference, this is done via next-day email (with photos) or via telephoning the customer contact. In the rare instances, when needed, our employees are trained to summon emergency personnel. Our employees are trained to see the things that others miss. Because we are a full service property maintenance firm, you will find our awareness of property needs far surpasses that of most sweeping-only companies. We can typically identify problems on your property early on, when they’re the least expensive to fix, and then work with you to develop the most cost-effective solutions. We use innovative and late model equipment, and keep it maintained so it will perform to manufacturer’s OEM specifications. This is very important, since parking area sweepers are vacuum-based. As a result, their performance level drops — and noise level increases — when they are not kept in tip-top condition. That’s why our company mandate is to keep our sweeping equipment maintained at OEM specs. 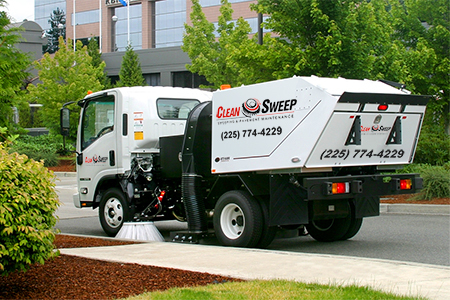 We maintain a backup sweeper for immediate service in the event of a breakdown. At Clean Sweep, Inc. you won’t hear excuses about us not being able to sweep when we’re scheduled. Backup sweepers are onhand for immediate use in the event one of our front-line sweepers goes down. These machines also allow us to have a quick reaction time for accident cleanup, emergency spills, etc.